Bush School's Mission Statement: "Excellence is our Plan by Doing all we can." Wow! It's hard to believe the first quarter is almost over! Our classrooms are all settled in and everyone is working hard. As I'm observing classrooms, it's amazing to see the high levels of engagement and learning taking place and the progress our students are making! Our professional development days have allowed teachers to work on implementing technology in the classroom, expanding knowledge on guided reading, incorporating guided math grouping, and data team to monitor the progress of student learning. We are so pleased to see the positive student outcomes that are in place. As we move forward, please contact our office if you have any questions or need assistance. We appreciate all you do in helping Bush School achieve and work toward meeting our goals for academic excellence! As many of you may have heard, I will be having major surgery later this month. On October 19th, Mr. Joe Davis and Mrs. Amy Hare will be covering the office and building needs during my absence. Mrs. Rhonda Metz will be subbing for Mrs. Hare and she is a highly qualified, certified teacher. I will see you, upon my return, sometime in late December or early January. 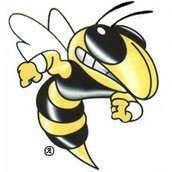 Be sure to like Bush Elementary on Facebook and keep up with our daily activities! We continue to be excited about having breakfast in the classroom! All students have an opportunity to receive a nutritious breakfast free of charge. Students have the opportunity to eat breakfast with their classmates and fuel up for the day to do their best learning. Breakfast is FREE for all students, however, they do not have to participate. At the present, we are serving approximately 85% of our students. The fall fundraiser is completed and the net profit was approximately $3,000. This year, PTO is saving funds to purchase updated playground equipment. 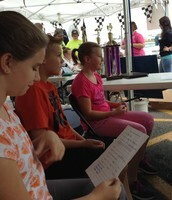 We greatly appreciate your help with our fundraising events. If you have any questions, please contact our president, Amy Schnoebelen. Please like Bush Elementary PTO on Facebook. Our Student Council organized the United Way Annual Penny Drive. 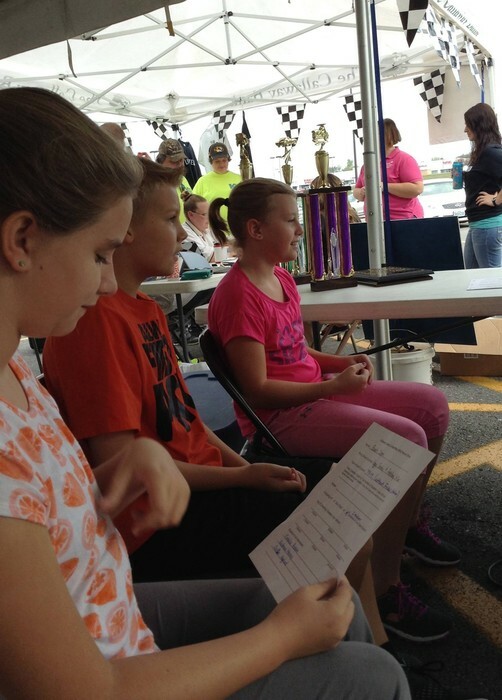 Bush School collected $1,079.49, which was donated on September 18th during their radiothon. 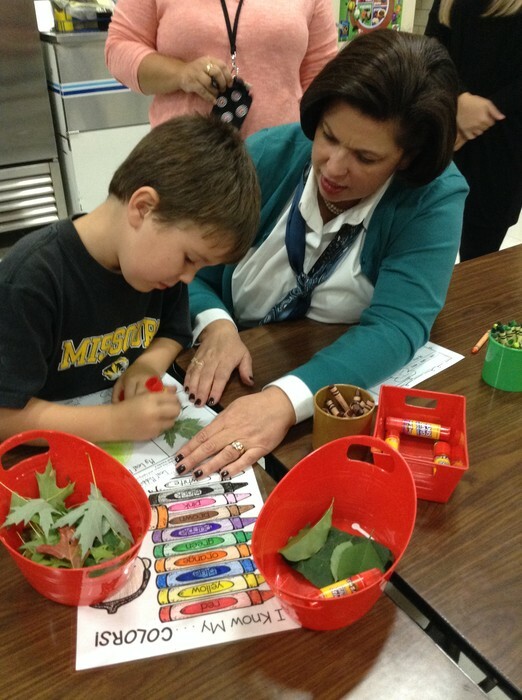 Literacy Night was held on September 29th with 52 families in attendance. Students had the opportunity to play reading games, make and take books, make smores, and all students in attendance received a free book for home reading. Bush School is a Title I School and provides school-wide programs to ensure that all low-achieving students receive the necessary services to assist them in becoming proficient learners. 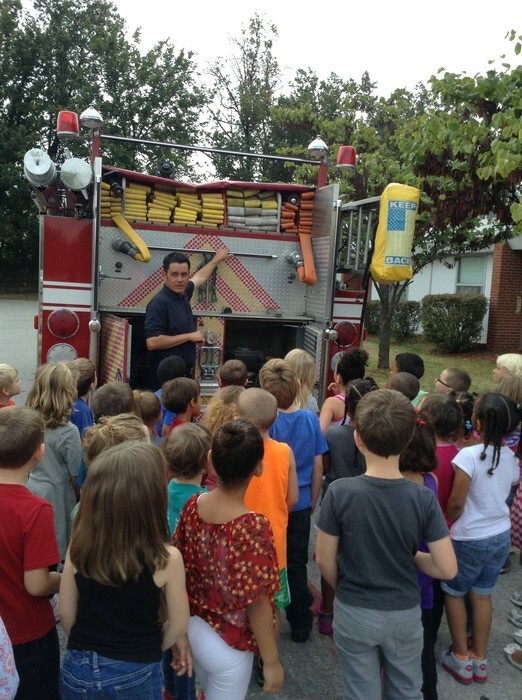 The Fulton Fire Department visited Bush School and met with students in grades K-2. 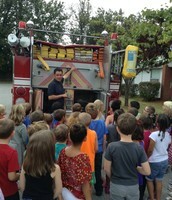 Students learned about fire prevention and safety and what to do to in case of an actual fire. Students received booklets, made hats and got to see the fire truck. We greatly appreciate the Fulton Fire Department taking time to visit our school! Each month, students are recognized for being safe, respectful and responsible learners. An assembly is held to recognize and celebrate their fine efforts and families are invited to attend this celebration. We have such awesome learners that it becomes difficult in the selection process! A BIG "shout out" to all of our Bush students for doing such an amazing job each and every day! Keep the positive referrals coming! Coming to the Principal's Office is not always a bad thing! 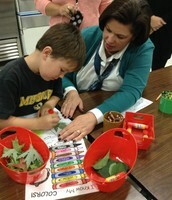 Our PBIS Program continues to support students as good problem solvers, good decision makers and responsible learners. To date, we have had a total of 140 positive referrals made during the first quarter. 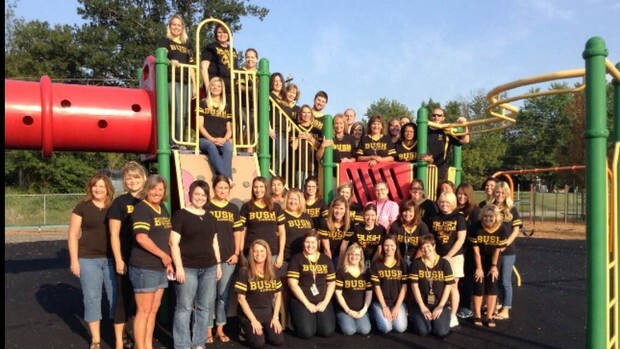 Way to go Bush School!!! Please be sure and check the student monthly calendar for additions or changes in dates.